Vegetable Bibimbap Fill 1 Created with Sketch. Bibimbap is a popular Korean dish whose name arose from the Korean word for "mixed rice." This delicious and nutritious meal traditionally consists of white rice topped with sautéed and seasonal vegetables, a fried egg, hot chili, sesame oil, and oftentimes sliced meat. These ingredients are then all mixed thoroughly before eaten. 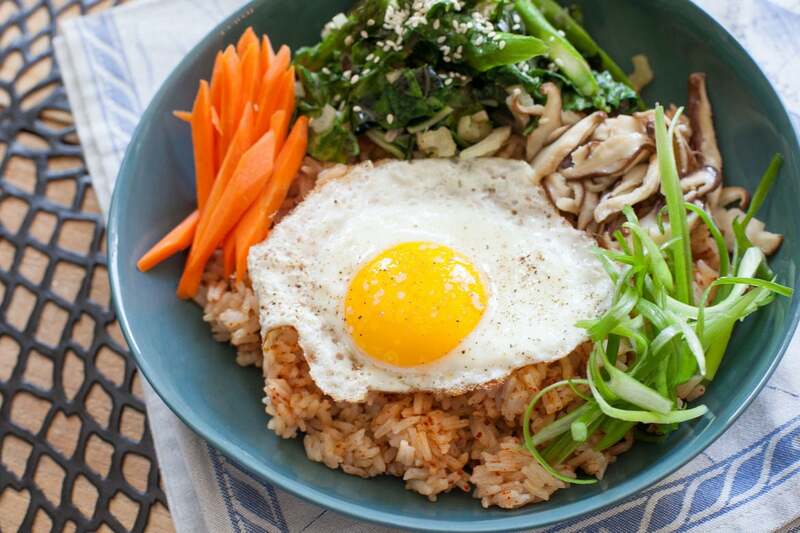 Bibimbap is also wonderfully versatile, as it can be served either hot or cold. 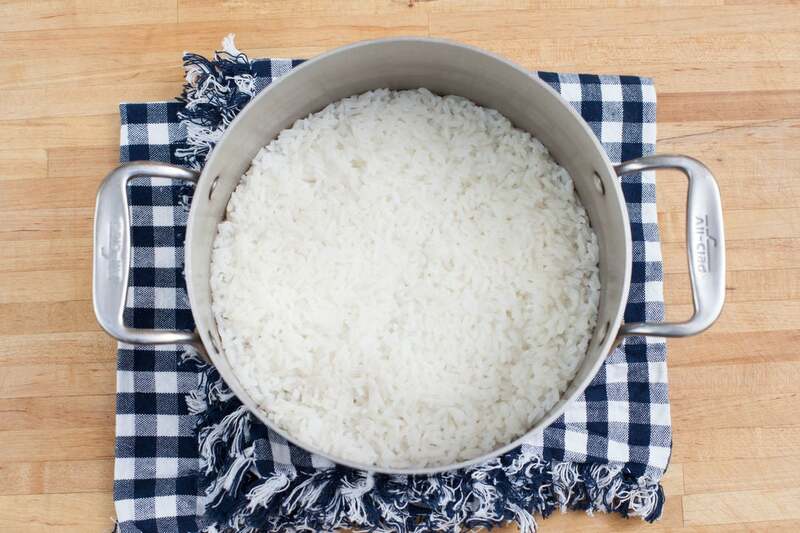 In a medium pot, combine the rice with 2 cups of water and a big pinch of salt. Heat to boiling on high, then cover, reduce the heat to low and simmer 15 to 17 minutes, or until cooked through. While the rice cooks, prepare your ingredients. Trim off the woody ends of the asparagus, then cut the spears into 2-inch lengths on an angle. Remove and thinly slice the thick chard stems. Stack and roll up the chard leaves then cut them crosswise to roughly chop. 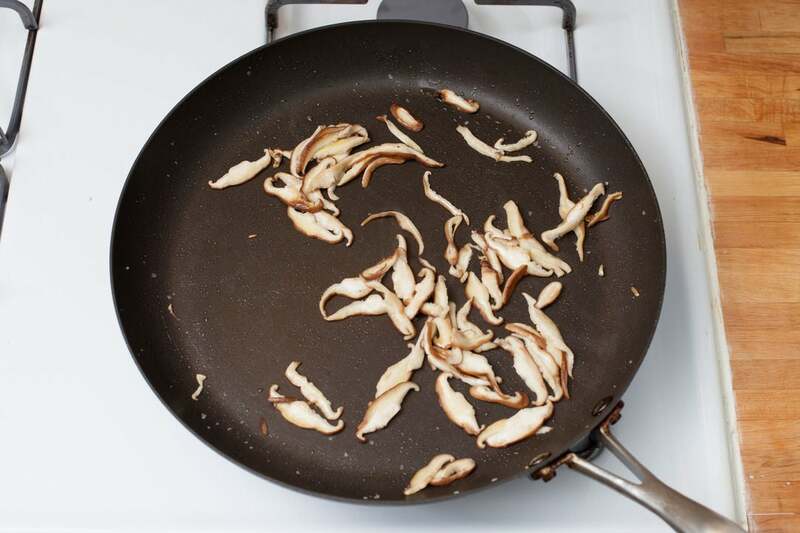 Remove the shiitake mushroom stems and thinly slice the caps. Peel and roughly chop the garlic. Crack the eggs into 2 separate small bowls or cups. Thinly slice the scallions lengthwise and put the slices in a bowl of cold water. Peel the carrot and cut it into matchsticks. While the rice continues to cook, cook the vegetables. Heat a little oil on medium until hot. Add the chard, asparagus, and garlic, and cook 2 to 3 minutes, or until the asparagus is bright green and tender-crisp, and the chard has wilted. Season with salt and pepper. Transfer the cooked vegetables to a plate. In the same pan, heat a little more oil on medium. Add the mushrooms, season with salt and pepper, and cook 1 to 3 minutes, or until softened. 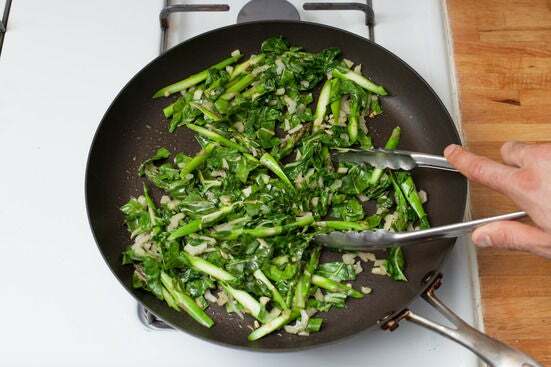 Transfer the cooked mushrooms to the plate with the chard and asparagus, keeping them separate. In the same pan, heat a little more oil on medium-high. Add the cooked rice to the pan and cook about 1 to 2 minutes, or until dry and slightly golden, stirring. Add the sesame oil, soy sauce, and chili flakes to taste. (If you like it spicy, add all the chili flakes, add less if you prefer mild heat.) Cook about 1 minute longer, stirring. 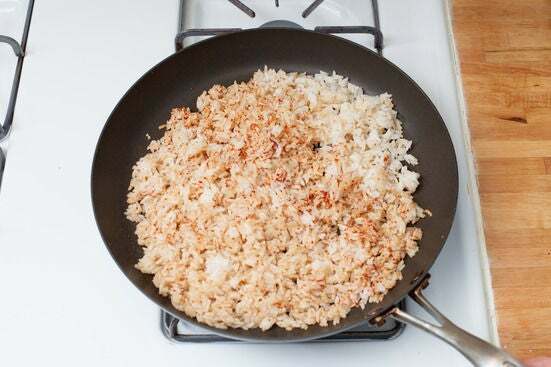 Transfer the rice to 2 bowls. In the same pan, heat a little more oil on low. 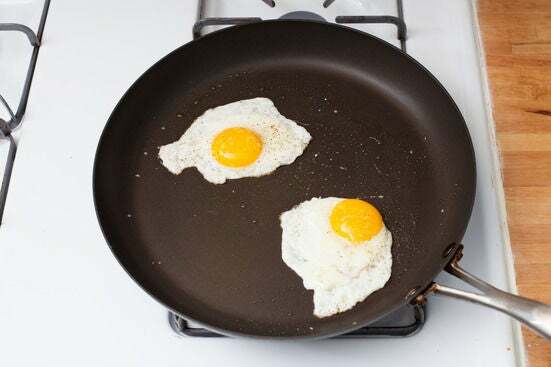 Carefully add the eggs to the pan, one at a time, keeping them separate. Season them with salt and pepper. Cook the eggs (sunny side up), 3 to 5 minutes, or until the whites are set and no longer translucent. 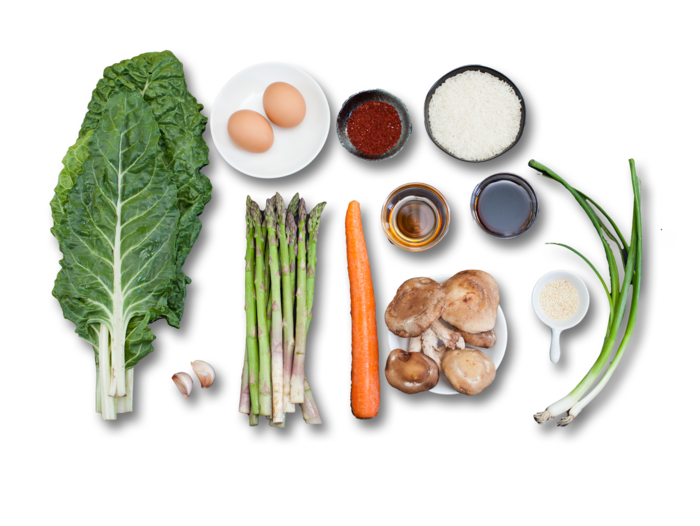 Top each bowl of rice with the cooked chard, asparagus, mushrooms, carrots, and a cooked egg. 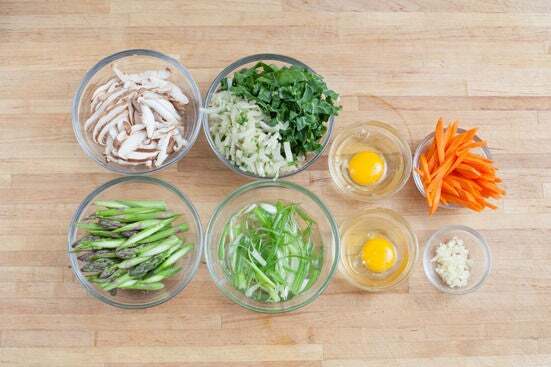 Garnish each with the scallions and sesame seeds. Enjoy!